Perioperative anaemia leads to impaired oxygen supply with a risk of vital organ ischaemia. In healthy and fit individuals, anaemia can be compensated by several mechanisms. Elderly patients, however, have less compensatory mechanisms because of multiple co-morbidities and age-related decline of functional reserves. The purpose of the study is to evaluate whether elderly surgical patients may benefit from a liberal red blood cell (RBC) transfusion strategy compared to a restrictive transfusion strategy. The LIBERAL Trial is a prospective, randomized, multicentre, controlled clinical phase IV trial randomising 2470 elderly (≥ 70 years) patients undergoing intermediate- or high-risk non-cardiac surgery. 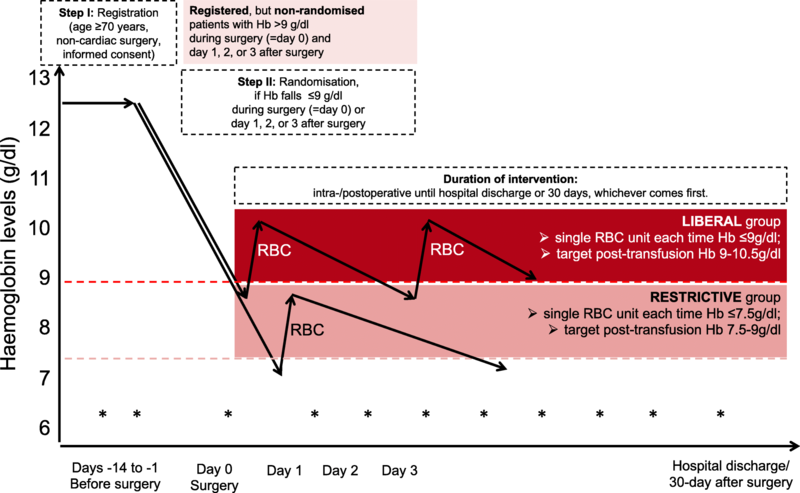 Registered patients will be randomised only if Haemoglobin (Hb) reaches ≤9 g/dl during surgery or within 3 days after surgery either to the LIBERAL group (transfusion of a single RBC unit when Hb ≤ 9 g/dl with a target range for the post-transfusion Hb level of 9–10.5 g/dl) or the RESTRICTIVE group (transfusion of a single RBC unit when Hb ≤ 7.5 g/dl with a target range for the post-transfusion Hb level of 7.5–9 g/dl). The intervention per patient will be followed until hospital discharge or up to 30 days after surgery, whichever occurs first. The primary efficacy outcome is defined as a composite of all-cause mortality, acute myocardial infarction, acute ischaemic stroke, acute kidney injury (stage III), acute mesenteric ischaemia and acute peripheral vascular ischaemia within 90 days after surgery. Infections requiring iv antibiotics with re-hospitalisation are assessed as important secondary endpoint. The primary endpoint will be analysed by logistic regression adjusting for age, cancer surgery (y/n), type of surgery (intermediate- or high-risk), and incorporating centres as random effect. The LIBERAL-Trial will evaluate whether a liberal transfusion strategy reduces the occurrence of major adverse events after non-cardiac surgery in the geriatric population compared to a restrictive strategy within 90 days after surgery. Perioperative anaemia leads to impaired oxygen supply with a risk of vital organ ischaemia resulting in major events such as myocardial infarction, ischaemic stroke, acute kidney injury, or acute mesenteric ischaemia. In healthy and fit individuals, perioperative anaemia can be compensated by several mechanisms that preserve oxygen transport and oxygen delivery. Therefore, current guidelines recommend a restrictive red blood cell (RBC) transfusion strategy in non-bleeding asymptomatic stable patients [1, 2]. Several trials revealed that restrictive transfusion is as safe as compared to a liberal strategy. It is noteworthy that the majority of trials only included a limited proportion of elderly patients [3–7]. The compensatory mechanisms, however, are impaired in old and frail patients. Elderly patients have an increased prevalence of cardiovascular comorbidities and decline of functional reserves. In 70 year old patients, e.g. arterial hypertension is present in 75% , diabetes mellitus in 25% , and atrial fibrillation in 10% . Therefore, normal anaemia-related compensatory mechanisms are severely impaired in elderly patients, which may result in greater vulnerability to anaemia-related ischaemic events and perioperative complications [11, 12]. Carson et al. studied 110 patients with acute coronary syndrome with a mean age of 71 years and found fewer major cardiac events and deaths if red blood cell (RBC) transfusion increased Hb > 10 g/dl compared to a restrictive strategy (10.9% vs. 25.5%) . One small trial including 40 patients with hip fracture compared a liberal (RBC transfusion if Hb < 10 g/dl) and a restrictive group (if Hb < 8 g/dl), and demonstrated a 2.5-times higher 30-day mortality in the restrictive group . The same group performed a subsequent trial enrolling 2016 patients older than 50 years of age, who had either a history of or risk factors for cardiovascular disease, and whose Hb level were < 10 g/dl after hip-fracture surgery. A restrictive strategy (Hb < 8 g/dl) was not superior to a liberal transfusion strategy (Hb < 10 g/dl) regarding mortality rate or inability to walk on 60-days follow-up . Until now, the available evidence for transfusion criteria is not sufficient for elderly patients. Thus, it is unclear whether current practice and guidelines apply in a geriatric population . Accordingly, major uncertainties exist among clinicians, and current clinical practice is variable [17, 18]. As a result of demographic changes clinicians have to handle a large number of elderly surgical patients with perioperative anaemia and relevant need for RBC transfusion. More than 50% of all RBC transfusions are used in elderly patients in daily practice, and current population dynamics will lead to an increasing demand for RBC transfusions in the old-age patient group . We hypothesise that a liberal transfusion strategy reduces the occurrence of major adverse events defined as the composite of all-cause mortality and severe ischaemic events within 90 days in elderly patients undergoing non-cardiac surgery compared to a restrictive transfusion strategy. The LIBERAL-Trial is a prospective, randomized, open, multicentre, controlled clinical phase IV trial targeting a sample size of 2470 elderly surgical patients in 15–20 German sites. A two-step approach will be used (Figs. 1 and 2): In step I, elderly patients (age ≥ 70 years) will be registered if scheduled for elective, non-cardiac surgery of intermediate or high risk. Written informed consent is obtained from the patients themselves or from their legally authorised representative/legal guardian. Risk assessment follows ESC/ESA guidelines: surgery-related risk of cardiovascular death and myocardial infarction . 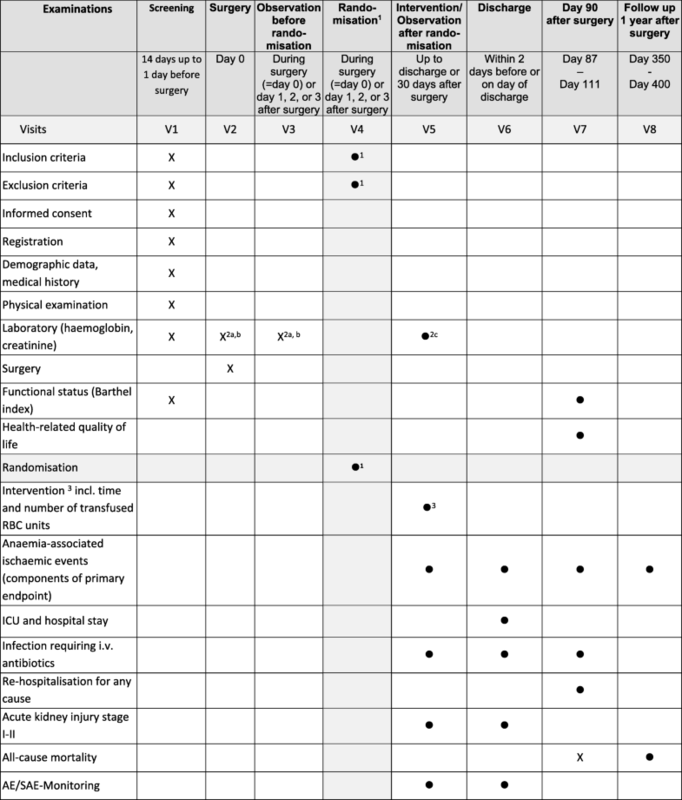 Intermediate risk surgery (30-day risk 1–5%) includes e.g. intraperitoneal surgery (splenectomy, hiatal hernia), peripheral arterial angioplasty, endovascular aneurysm repair, as well as head and neck, major neurological/orthopaedic (hip and spine), major urological, major gynaecological, intra-thoracic surgery. High risk surgery (30-day risk > 5%) includes e.g. aortic and major vascular, open limb revascularisation, duodeno-pancreatic, liver resection, oesophagectomy, adrenal resection, total cystectomy. Registered patients will be randomised later only if and as soon as Hb reaches ≤9 g/dl during surgery (=day 0) or day 1, 2, or 3 after surgery (step II). If Hb remains > 9 g/dl patients do not enter the main study but vital status (all-cause mortality) will be determined 90 days after surgery. Mild drop of haemoglobin < 9 g/dl due to induction of anaesthesia before skin incision is permitted and not an exclusion criteria. Exclusion criteria at registration comprise preoperative severe anaemia with Hb level < 9 g/dl, chronic kidney injury requiring dialysis, suspected lack of compliance with follow-up procedures, expected death within 3 months, participation in other interventional trials or previous participation in our trial, temporary inability to provide informed consent with absence of a legally authorised representative/legal guardian, and preoperative autologous blood donation. Additional exclusion criteria at randomisation exclude patients who experienced any component of the composite endpoint or received any allogeneic blood transfusion since registration. RESTRICTIVE group: patients receive a single RBC unit each time Hb reaches ≤7.5 g/dl (≤ 4.7 mmol/l) with a target range for the post-transfusion Hb level of 7.5–9 g/dl (4.7–5.6 mmol/l). The target post-transfusion Hb level needs to be reached within 24 h upon receipt of triggering lab result. The intervention per patient will be followed until hospital discharge or up to 30 days after surgery, whichever occurred first. Physicians will be allowed to refuse to transfuse, or transfuse patients irrespective of the group assignment in exceptional cases, e.g. hypervolaemia, symptomatic anaemia with physiological triggers of anaemic hypoxia, or massive/life-threatening bleeding, but must document the reason(s) in the study eCRF. Central internet randomisation at the Clinical Trial Centre Leipzig uses block randomisation with variable block length stratified by centre. For urgent randomisation or in case of internet unavailability randomisation can be performed using sealed envelopes. Envelope randomisations will be checked during on-site monitoring. All trial patients will receive standard perioperative care. The patients in both groups will not be exposed to additional risk since transfusion-strategy studies almost showed the same results. Hb transfusion thresholds used in previous studies varied from 7 to 10 g/dl for the restrictive and from 9 to 13 g/dl for the liberal group, respectively [5, 6, 15]. In addition RBC transfusion is the main treatment option for anaemia due to surgical blood loss. All patients benefit from intensive monitoring and consequently early detection of any decrease of Hb-level. The strategies under evaluation use different Hb levels as trigger for RBC transfusions and aim at different target ranges of Hb levels to be maintained. The trial drug will be manufactured and used as in standard care. Only commercially available approved RBC units will be used within this clinical trial and a list of these approved RBCs is online available (http://www.pei.de/DE/arzneimittel/blutprodukte/blutkomponenten-zur-transfusion/erythrozytenkonzentrate/erythrozytenkonzentrate-node.html). RBCs are provided by the local blood bank according to clinical routine considering the requirements of § 63i AMG. This will assure the participants’ safety, the traceability and identification of the RBCs given. Therefore, a special labelling of the RBCs for the trial according to § 42 AMG and § 5 GCP-V is not necessary. The primary efficacy outcome is a binary composite of death from any cause and anaemia-associated, ischaemic events (defined as acute myocardial infarction, acute stroke, acute kidney injury stage III, acute mesenteric ischaemia, acute peripheral vascular ischaemia) within 90 days after surgery. With the proposed composite, we assess relevant anaemia-associated ischaemic events encompassing five different organs (brain, heart, kidney, gut, limbs) where the assigned Hb level/transfusion strategy will likely have an effect. All-cause mortality is defined as death from any cause. Acute myocardial infarction confirmed by a cardiologist. Acute ischaemic stroke confirmed by a neurologist. Acute kidney injury (stage III) is defined according to the Kidney Disease Improving Global Outcomes criteria: Increase of plasma creatinine level ≥ 3 times within a time window of 7 days or initiation of renal replacement therapy . Acute mesenteric ischaemia is defined as ischaemia confirmed by intervention (abdominal surgery or mesenteric angiography). Acute peripheral vascular ischaemia is defined as a new non-thrombotic compromised circulation in a limb confirmed by angiography and/or leading to surgery. After hospital discharge, events will only be considered as present if they lead to hospital re-admission or death. Direct transfer to another hospital will not be defined as re-admission. Infection was not included into the composite endpoint since more transfusions may reduce ischaemic events, but might show a counter effect increasing the infection risk. The occurrence of any individual component of the composite at hospital discharge, at 90 days, and 1 year after surgery. Proportion of patients receiving RBC transfusion and the number of units transfused. Total length of stay in the intensive care unit and in hospital from randomisation to discharge (for strategy comparison); in addition, total length of stay in the intensive care unit and in hospital from admission to discharge will be used for descriptive purposes. The occurrence of acute kidney injury (stage I or II) defined according to the Kidney Disease Improving Global Outcomes criteria  (stage I: increase of plasma creatinine level ≥ 1.5–1.9 times baseline or ≥ 0.3 mg/dl within 48 h; stage II: increase of plasma creatinine level ≥ 2–2.9 times baseline within a time window of 7 days) during the initial hospital stay. Time to (first) infection (infection requiring therapeutic intravenous antibiotic treatment (pneumonia, wound infection, sepsis, central line associated blood stream infection [21–23])) during the initial hospital stay or leading to hospital re-admission within 90 days after surgery. Time to (first) re-hospitalisation within 90 days. Functional status (assessed by Barthel Index [24, 25] by telephone questionnaire). Health-related quality of life (assessed by EuroQoL EQ-5D [26, 27] and 12-item World Health Organisation Disability Assessment Schedule WHODAS 2.0  by telephone questionnaire). For the primary endpoint, we expect an overall composite complication rate (OCCR) of about 25% at 90 days after surgery. This guestimate is based on a subgroup of elderly patients included in a large observational study in the field of Patient Blood Management , which reported most of the endpoint components, and is also based on the assumption that about 25–40% of registered patients will be randomised. The effect size to be detected is set to an odds ratio of OR = 0.765. The available evidence on treatment differences from randomised trials concerning the old age group is sparse and inconsistent. Therefore, we choose an effect size, which is relevant from a clinical perspective. Assuming an OCCR of 25%, an odds ratio of OR = 0.765, corresponding to a 5% reduction in OCCR from 27.5% to 22.5% or risk reduction of 18%, would justify switching to the liberal transfusion strategy. The target sample size is N = 2470 randomised patients. Randomisation of 2 × 1176 = 2352 patients is required using a two-sided significance level of 5% and requiring power of 80% for a test of the null-hypothesis OR = 1 versus OR = 0.765 based on the normal approximation to log (OR). We allow for a dropout rate of up to 5%. The full analysis set for the primary efficacy analysis will be as close as possible to the ideal implied by the intention-to-treat principle and includes all randomised subjects. A secondary per-protocol analysis of the primary outcome will be performed in all patients without major protocol violations. Most endpoints will be analysed with scale-appropriate generalised linear mixed models adjusting for age, cancer surgery (y/n), type of surgery (intermediate- or high-risk), and incorporating centres as random effect. Further baseline clinical variables may be entered in secondary analyses. For the primary endpoint, logistic regression will be used to estimate the treatment effect on the odds ratio scale with two-sided 95% confidence intervals provided. Secondarily, also point estimates and confidence intervals for the rate difference and the relative risk will be provided. The test of the null hypothesis that the odds ratio concerning the composite endpoint is equal to one will be tested using the Wald statistic for the coefficient of the treatment effect in the logistic regression. One formal unblinded interim analysis is scheduled after about 1450 patients with 90-day endpoint information in order to detect early superiority. This interim analysis will use a significance level of alpha = 0.001 such that the final analysis does not require adjusting for multiple testing. With this interim analysis, we will have 80% power to detect an odds ratio of 0.6, which corresponds to an OCCR difference in the order of 10%. If the interim analysis turns out significant, the trial will be stopped, unless the Data Monitoring Safety Board (DMSB) recommends otherwise. The responsible study biometrician will perform the formal interim analysis, write a strictly confidential report and discuss the results exclusively with the Data Monitoring Safety Board. If the DSMC recommends continuing with the trial, the Sponsor, the steering committee, the investigators, and the study team will only receive the information that the interim analysis for early superiority was performed and discussed with the DSMC and that the trial continues. All respective documents and analysis scripts are kept on a dedicated file system to which only the biometrician and his assistant have access rights. We hypothesise that the benefit from a liberal transfusion strategy increases with declining anaemia compensatory capacity. Any resulting hypothesis requires confirmation in independent data. We collect course of Hb levels during surgery (= day 0) or day 1, 2, 3 after surgery and the vital status at day 90 (all-cause mortality) for all registered patients. The prognostic value of delta Hb (difference pre-op Hb and Hb on day three) and Barthel index on short term mortality will be analysed adding these factors to the generalised linear mixed model specified above. On-site monitoring follows a risk-adapted approach [31, 32]. Pre-study, initiation, regular, and closeout visits will be performed in all centres. The first regular visit takes place after discharge or day 30 after surgery of the first 3 randomized patients, the following visits will be performed after the discharge of additionally 15 more patients, but at least once a year. The intention of the visits will be to achieve high protocol compliance and data quality, as well as to ensure patients’ safety and rights. Central monitoring will include a timely query management process based on consistency and plausibility checks combined with a dunning process for missing documentation. In addition, the trial biometrician performs statistical monitoring regularly in order to detect general and centre-specific problems in key study processes. Quality endpoints include accrual rate, rate of dropouts and protocol violations, promptness of randomisation when anaemia emerges, adherence to the assigned transfusion strategies, as well as timeliness of documentation. The transfusion of allogenic RBC units is the standard procedure to treat peri- and postoperative severe anaemia. More than 50% of all RBC transfusions are used in old and frail patients, and current population dynamics in most developed countries will lead to an increasing demand for RBC transfusions . Elderly patients have an increased prevalence of cardiovascular comorbidities and decline of functional reserves. Therefore, anaemia-related compensatory mechanisms are severely impaired in elderly patients, which may result in greater vulnerability to anaemia-related ischaemic events and perioperative complications [11, 12]. Here, the LIBERAL-Trial will provide a definite answer for this patient group whether a liberal transfusion strategy reduces the occurrence of major adverse events defined as the composite of all-cause mortality and severe ischaemic events within 90 days after non-cardiac surgery compared to a restrictive strategy. Potential limitations might refer to cross-over between groups, needing to ‘register’ a large number of patients, lack of recruiting, and drop-out due to various protocol violations. Study protocol (V3.0) was finalised at 17th of October 2017. This trial was registered at https://clinicaltrials.gov/ct2/show/NCT03369210 (identifier: NCT03369210) at 12th of November 2017. Recruitment and enrolment of the patients started in January 2018, more than 200 patients have been registered and more than 100 randomised so far. The planned recruitment lasts 36 months. Medizinische Universität Wien: David Baron (david.baron@meduniwien.ac.at). This work is supported by the German Research Foundation (Deutsche Forschungsgemeinschaft; grant no. ME 3559/3–1) who had / will not have any impact in the design of the study and collection, analysis, and interpretation of data and in writing the manuscript. The datasets generated and/or analysed during the current study are available from the corresponding author on reasonable request after the end of the trial. A fulfilled SPIRIT 2013 Checklist is available as an Additional file 1. All authors have substantially contributed to the interpretation of current specific knowledge, which resulted in the conception and design of the present trial. PM, KZ, SC, MMM, ES, and DH are investigators of the present trial and participated in the acquisition of funding. PM, SL, ST, RF, CS, MV, MW, EG, CS, AK, MC, SS, MB, GJ, MM, TE, AZ, PK, MK, AH, RLF, MF, EW, KHG, PK, MGA, MS, MB, TS, and MG contribute to the collection of data. OB and HB are responsible for project management. DH wrote the statistical methods. All authors have been involved in drafting the manuscript or revising it critically for important intellectual content, and approved the final manuscript. Study protocol V3.0 (EudraCT-Nr 2016–004446-29), patient information, and informed consent were approved by the Ethics Committee of the University of Frankfurt (Ref: 139/17F) and of all participating centres. At the same time the study documents have been approved by the responsible federal authority (Paul-Ehrlich-Institute) according to the requirements of GCP-V § 7. Each patient must give written informed consent to participate in the study. M.M and E.S. work for the German Red Cross, deliver RBC units and may have a financial competing interest. All other authors declare that they have no competing interests. Barthel Index Hamburger Manual [https://www.dimdi.de/static/.downloads/deutsch/hamburger-manual-nov2004.pdf]. Accessed 29 Jan 2019.